ESO turns fifty this year, and to celebrate this important anniversary, we are showing you glimpses into our history. Once a month during 2012, a special Then and Now comparison Picture of the Week shows how things have changed over the decades at the La Silla and Paranal Observatory sites, the ESO offices in Santiago de Chile, and the Headquarters in Garching bei München, Germany. Our pair of photographs this month show how the computing power used by ESO has changed dramatically over time. Both photographs show Austrian astronomer Rudi Albrecht in front of ESO’s computer systems, but on dates separated by decades. In the historical image, taken in 1974 in the ESO offices in Santiago, Chile, we can see Albrecht, pencil in hand, poring over code in front of a teletype. He was working on software for the Spectrum Scanner attached to the ESO 1-metre telescope  located at the La Silla Observatory. The data were processed in Santiago using the Hewlett Packard 2116 minicomputer which can be seen behind the printer. This bulky computer, with one processor and a breathtaking 16 kilobytes of magnetic-core memory (! ), stored the results on magnetic tape, ready for further processing by visiting astronomers on computers at their home institutes. To handle files on tape that were larger than the available memory, Albrecht developed a virtual memory system, which he contributed to the Hewlett Packard Software Center. 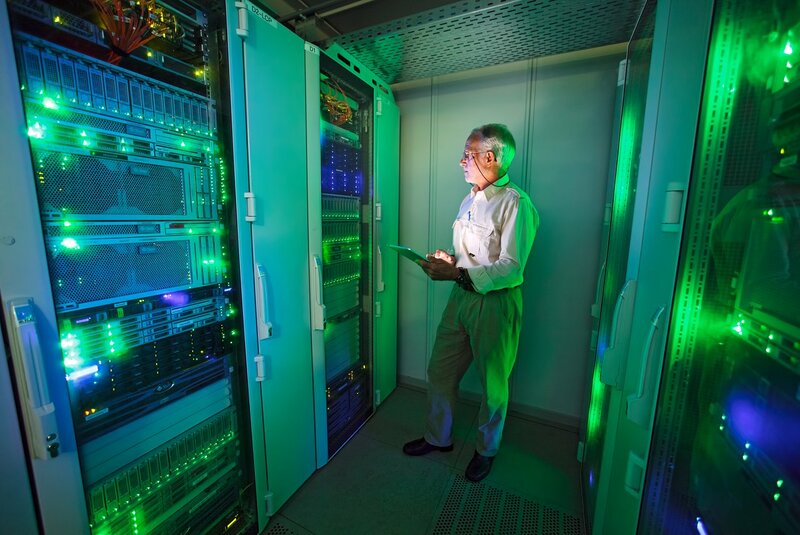 The present-day photograph shows Albrecht in the Data Centre at ESO Headquarters in Garching bei München, Germany, which archives and distributes data from ESO’s telescopes. 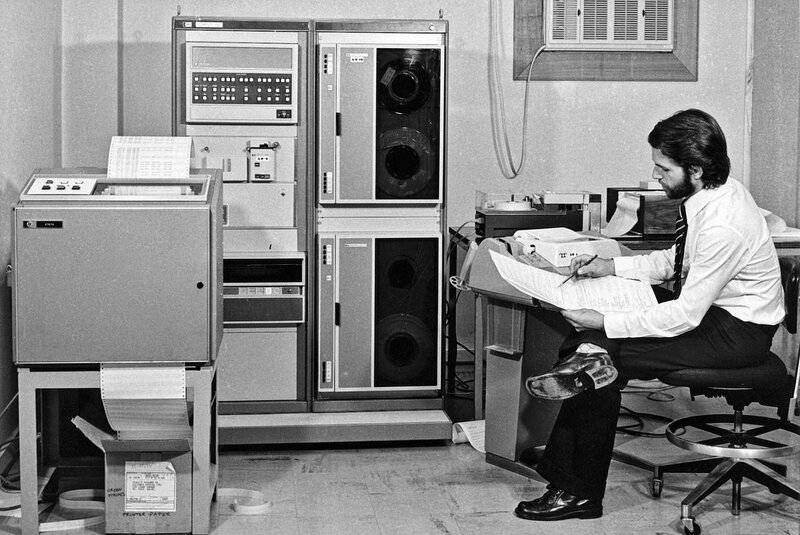 He is in front of a rack containing a system with 40 processor cores, 138 terabytes of storage capacity and 83 gigabytes of RAM — over 5 million times more than the machine used by him back in 1974! Even the tablet computer he is holding far outperforms the older machine, and provides a modern alternative to pencil and paper. Over the years, ESO’s computing systems have developed to handle the flood of scientific data from the observatory’s telescopes. Advances in telescope, detector, and computer technology mean that observatories now produce massive quantities of images, spectra, and catalogues. For instance, the two survey telescopes at Paranal, the VST and VISTA, together produce over 100 terabytes of data per year. It’s a far cry from the days of magnetic tape and 16 kilobytes of memory! The ESO 1-metre telescope was decommissioned in 1994.